Garmser District, Afghanistan – The heat of southern Afghanistan radiates the same way as if you had put your face in front of an open oven door with no room to recoil. The temperature soars to 110 quickly and has spiked to close to 140 from time to time. 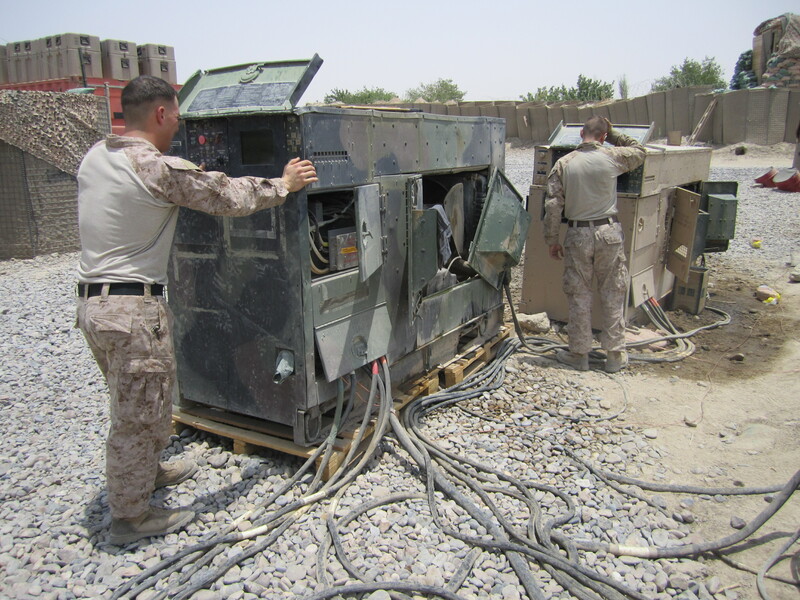 And while the U.S. may be spending $20 billion on its power bill for operations in Afghanistan, according to a published report, it’s not because all the generators are humming along keeping everyone cool. Breakdowns are routine and generator mechanics are in short supply, so it’s easy to go to any Marine Corps base and spot a gaggle of Marines jumping a generator with their MRAP or that one Marine who grew up on a farm and knows something about generators sweating over a greasy, tired-looking generator that isn’t working. Sgt. 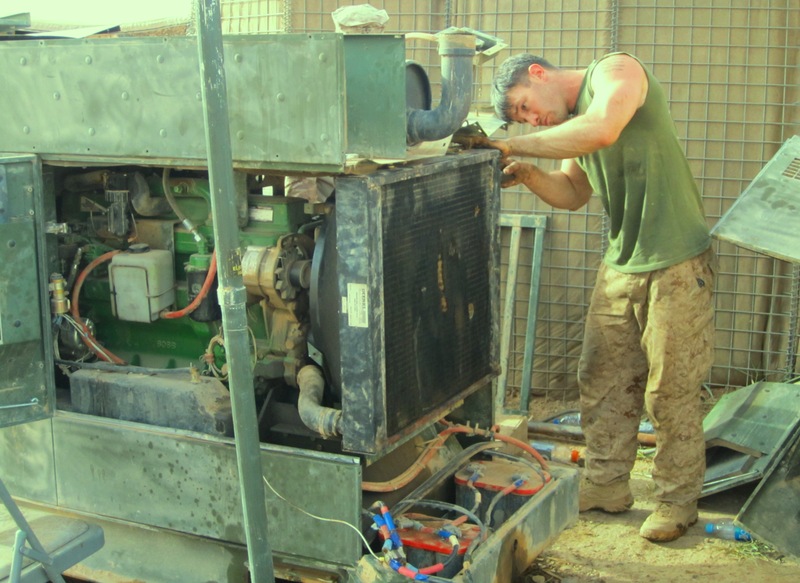 Jacob Abrahmson works on a generator in Marjah. “On my last deployment in Iraq, I got conned into doing this because if we didn’t want to live like cave people we had to do something,” said Sgt. Jacob Abrahamson of 3rd Platoon, Bravo Company, 1st Battalion, 23rd Marines. He cannibalized another generator for a part he needed to get theirs going. Granted, this war is by far the most energy-hungry war in history and everyone needs an outlet on the power strip. My computer is plugged in right now and I’ve got a blast of cool air blowing my hair around. But down the road from here and across Helmand there are uncharged radios, dormant air conditioners, blank computer screens and thousands of bottles of hot drinking water, victims of the generators that can’t take the heat. My respect for the British of 1839 increases with every story like this. …and to think I bitched about the 95 degree temps in Colorado today…sad statement for sure when we consider all the sons and daughters who suffer daily with the sun and dust in Afghanistan..